Left-handed reliever Bill Bray's last appearance wearing a Reds uniform was during their final game of the 2008 season. Bray missed the entire next season rehabbing Tommy John surgery he received on May 19, 2009. 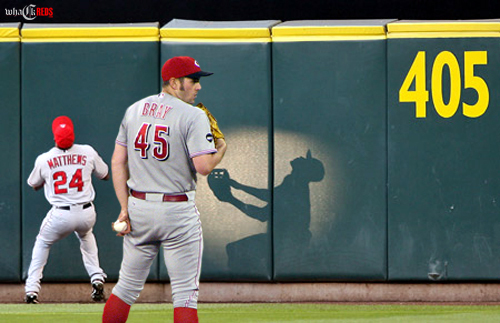 After over thirteen months of recovery, Mr. Bray is back in the Reds bullpen. In 10.1 innings pitched between A Lynchburg and AAA Louisville this season, Bray struck out sixteen batters, walked three, allowed three hits, and failed to let up a run. Sam LeCure (1-4, 4.86) was sent down to AAA make room for Bray on the Reds' roster. The move leaves the Reds will only four starting pitchers, but one will not be needed until after their three game series with the Philadelphia Phillies this week. The Phillies are loaded with left-handed hitters and Dusty Baker likes the idea of having three lefty relievers available while playing the 2008 World Series Champions. Left-hander Travis Wood (5-6, 3.12) struck out nine batters during eight innings of shutout baseball on Friday for Louisville. Sam LeCure's former spot in the Reds' rotation will fall on Thursday while Wood's falls on Wednesday for Louisville. Wood could easily be pushed back a day to start against Carlos Silva (8-2, 3.01) and the Chicago Cubs at Wrigley field on Thursday making his major league debut. A coinciding move will need to made when the Reds decide on a starter. Expect Bill Bray to remain with the Reds. Bray has pitched very effectively while rehabbing in the minors and has a track record in the majors since 2006 (8-7, 3.86). With Jordan Smith's sound transition into the majors (6.2 innings, 1.35 ERA) and great improvement from Nick Masset and Logan Ondrusek, left-hander Danny Herrera (1-3. 4.09) may become temporarily out of the mix. In the meantime, we will enjoy the extra left-handed manpower against the Phillies. “Sometimes when you are trying to win a pennant," Dusty Baker said. "You have to make these temporary, auxiliary moves." For those who reside under rocks (not that there's anything wrong with that), the Reds signed Gary Matthews Jr. to a minor league deal and he reported to Louisville on Thursday night. Matthews Jr. started for the Bats against Norfolk on Saturday and Sunday with mixed results. On Saturday Matthews Jr. struck out five times and went 3-5 with a double and a run on Sunday. Matthews Jr. was released on June 15 by the Mets after batting .190 in 65 plate appearances. The Mets acquired Matthews Jr. from the Angels prior to the 2009 season. After an All-Star season with the Texas Rangers during 2006 (.313, 19HR, 79RBI), Matthews Jr. signed a 5-year $50 million contract with the Angels. Through '07-'09 Matthews Jr. batted .248, hit 30 homeruns, and drove in 168 runs. Matthews Jr. will become the everyday centerfielder at Louisville. "In the past, he showed that if he plays a lot, he's a better player," general manager Walt Jocketty said. "He hasn't had that opportunity with the Angels or Mets the last couple of years. Hopefully, if he can get back, at some point he can help us at the Major League level. This is a very inexpensive option to add depth, but we think he's going to take a little while." The Reds will begin a three-game series against the Philadelphia Phillies at Great American Ballpark on Monday. Go Reds!!! *Update-Bill Bray pitched the ninth inning for the Reds on Monday against the Phillies. With the Reds leading 7-1 after Johnny Cueto pitched eight innings of one run ball, Bray stepped onto a major league mound for the first time in almost two years. Bray allowed two runs on two hits, but secured the win for the Reds. Lance McAlister speculated a interesting move for the Reds on his 700wlw show Monday. Lance proposed the idea that Aaron Harang should be moved back to start on Thursday against the Cubs at Wrigley allowing Travis Wood to pitch on Wednesday. The move would not only give Harang an extra day of rest, but would keep Wood on his regular pitching schedule. The left-handed Wood would face the Phillies' lefty-stacked lineup (instead of a Cubs' that prefers hitting lefties) and he would comfortably make his major league debut at home.